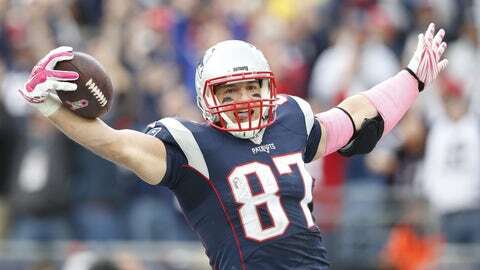 Rob Gronkowski should probably stick to catching footballs. Since coming into the league in 2010, Rob Gronkowski’s played in the Super Bowl twice — one of which the New England Patriots won. He’s one player that’s extremely familiar with the nuances of the week leading up to the game and the preparation that goes into it. With that said, he still doesn’t have much advice for the Carolina Panthers, who will take on the team that knocked the Patriots out of the playoffs: the Denver Broncos. In fact, the only tips he gave the Panthers were to score more points than the Broncos. In addition to sharing his less-than-helpful advice, Gronkowski also played some football. Well, paper football. He took on former Patriots linebacker Willie McGinest in a field goal-flicking contest on the set of NFL Network in San Francisco. Let’s just go ahead and say he’s better at catching footballs than he is at flicking them. Fortunately, he gets paid for scoring touchdowns as a tight end and not a professional "flick footballer."